Who would you award for their contribution to wind power in Europe? Can you think of someone who has made a major contribution to wind energy in Europe? And would you like to see this person recognised with a major international award to celebrate their achievements in wind energy? The Poul la Cour Prize is your chance to make this happen. What’s the Poul la Cour Prize? Named after wind power pioneer Poul la Cour, the Poul la Cour Prize is a cooperative effort between WindEurope and the Poul la Cour Foundation. Last awarded in 2014, the Poul la Cour Prize is now to be a biennial award recognising the people who have made a unique contribution to wind power in Europe. See previous winners. This year, the Poul la Cour Prize 2019 will be awarded at the WindEurope Conference & Exhibition 2019 in Bilbao, Spain (2-4 April). And you can nominate a candidate to win the award. You can nominate anyone who has contributed to a unique and lasting improvement for the benefit of the development and use of wind power in Europe. What’s most important when choosing your nominee? Your nominee must have contributed a unique and lasting improvement to the development and use of wind power in Europe. Your nominee must be living and working within the EU28/EEA. What’s not important when choosing your nominee? Whether your nominee comes from within the wind power industry or its associated areas. You can only propose one nominee. You cannot propose anyone who holds a position in politics, national and/or European parliament. Submit your candidate by 10 February 2019. The nomination process is now closed! The winner of the award will be directly informed at the beginning of March 2019. 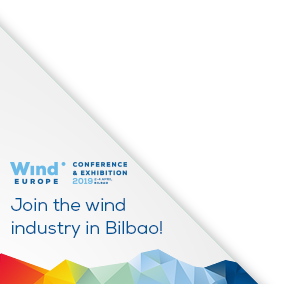 The award ceremony and public announcement of the winner will take place at the the WindEurope Conference & Exhibition 2019 in Bilbao, Spain.